We always come here during our HHI visits. This is such a nice change of pace from the beach. This was our first off season visit and we did a trail ride. It was so much fun. We took an hour ride on trails through Sea Pines. The guides were wonderful and took good care of my 8 year old. We’ll definitely be back! Everyone here was so nice, welcoming, and friendly. We haven't been on horses since we were children and now we are seniors. 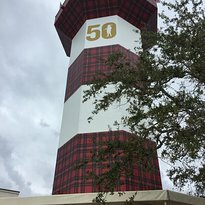 We have driven past this picturesque area over the years as we go through Sea Pines on our vacations. This year we were determined to go here. We had a great time. We saw absolutely no animal abuse as mentioned in some reviews. The area is clean, there is water, there is food. My horse Bonita wanted to munch along her ride with me as I'm sure the clover looked very appealing to her much like a beloved pet dog is very attuned to munching food when walking in the woods. Our guide was knowledgeable and sweet. The only downside was the fact that we could not hear her. There were four of us plus the guide. The person directly behind her was an experienced rider and basically monopolized her. We were the last two. We felt like we missed out on all the things she was saying about the area, the trees, the alligators, etc. This is why this experience didn't get 5 stars. My wife has always wanted to go on a horseback ride since we were married 45 years ago and I'm sorry I waited so long! It was a beautiful day in the 70's and when we walked in the front door Kayla welcomed us with a beautiful smile and a warm spirit. She took us almost immediately to meet out guide Eli who was the nicest young man and was equally excited to greet us and after a brief safety lesson behind the hitching post helped us to mount Corona and Dolly, two beautiful horses. Since we were the only ones there for the 11:00 ride we had Eli all to ourselves. He took us through the most beautiful live oaks and pines along a trail that wound around small ponds and across a couple of roads. He continuously turned around in his saddle, which must have been hard on his neck and back, to talk with us non-stop and answered every question with enthusiasm. He could not have been friendlier or more helpful and truly made the entire experience extremely enjoyable. The horses just took a very slow pace along the trail and did not give us any problem whatsoever during the hour long ride. When we got back to the stables Eli took our photo on the horses and he seemed pleased that we wanted a photo of him and his horse. Kayla once again was very sweet as we left and invited us back. 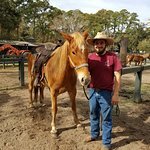 Out of our 3 day stay on Hilton Head Island this was our best experience and when we go back we will definitely take another ride at Lawton Stables! Growing up I used to ride horses therefor, I thought it would be a fun idea to bring my daughter to take a trail ride. She was so excited, but also nervous because she'd never ridden a horse before. We got there a little early to let my daughter go through the small petting zoo. She loved that as did I. Her favorite animal was the miniature horse. We then got to watch the employees bring out the horses for all of us. I immediately noticed how exhausted all of the horses looked. They were all half asleep, standing directly in the hot sun, sweating, and just kind of moping around. They looked miserable. On a positive note all of the female staff were very friendly and great to talk to, but the gentleman that seemed to be in charge was what ruined the experience. We both witnessed him getting mad at a horse for something and then he proceeded to very aggressively reprimand the horse with physical force to the point where the horse was scared of him. I glanced over at the other staff to see what their reactions were and I could even see in the other staff's eyes that they didn't approve of what was happening. As a result, every time the man would get near the horse, the horses eyes would get huge with fear. As a mother, hearing my daughter ask me, "mom why is that man being so mean to that horse?" I honestly didn't know how to respond. I was shocked with the way that he acted in a family place. If we just saw that out in the open it makes me question what happens behind closed doors. Then we were called into the mounting area to hear instructions. My daughter was already nervous and then was frightened by the man who then picked out my daughter because she was nervous. He kept messing with her and it made her very uncomfortable. I was just very disappointed with what I witnessed at what is supposed to be a fun place for kids. To add onto the experience I would like to share other things that didn't settle with me well. I was put on a horse named Hank. A pretty horse that was obviously lame. The minute they walked him up to the stool I immediately noticed that he was walking very off. Being a concerned customer I asked the man if the horse was okay which he replied with a bad attitude (which i'm guessing was a result of the horse making him mad) "he's fine he's just trying to get out of working he's lazy." I brushed it off and then got on the horse to continue to the ride. We were split up into groups of six and we had one trail guide in the front. Luckily my daughter and I were in the front so we got a good experience but I felt like the people in the back were a little left out. It was very hard for them to hear the guide even though she was speaking loudly and clearly. Our guide was very informative and extremely friendly. Throughout the ride I could feel Hank's limp getting worse. I called the guides attention to it and she seemed to be concerned and told me that she would get someone to look at him when we got back. I felt so bad riding this horse who was obviously in pain. The trail was beautiful and we really enjoyed the scenery and the fun time we had with the guide. The guide helped my daughter feel much more comfortable riding the horse by herself. I was curious to know how often the horses went out on rides and when I asked the guide she told me that they all pretty much work everyday five rides a day. When we got back the man was helping us dismount. We were told on our way back that we would be able to get a picture together and when I asked the man he said that they didn't have enough time. That really upset me because my daughter really wanted a picture of her on a horse. I was tempted to say something, but my daughter told me not to because she was already scared of the man. To top it all off my daughter was petting her horse and I overheard our guide tell the man that Hank was very lame on the ride "AGAIN." AGAIN?? why is this horse still being used if he's hurt? The man then said "we don't talk about that when customers are around. He's fine" He didn't realize I was standing there, but i heard what he said and I was appalled. I wonder how many other horses they have made work even when they are lame. It breaks my heart to think about not only that but how they are treated by the guy in charge. If this is such a family place why do they have someone that is so aggressive working there not only just as an employee, but as someone who is in charge. I hope this review will open some eyes to what's going on and I hope for the sake of the animals, that the way this establishment is run will be considered and fixed. Lawton Stables has great potential and I hope my review makes a difference. My wife and I recently had the pleasure of visiting the Lawton Stables and going on a one hour trail ride. 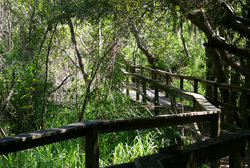 What a wonderful way to spend a beautiful morning in the Sea Pines nature preserve. Our guide, Maddie was extremely nice and very knowledgeable. She kept a running commentary full of interesting tidbits and fun facts about the area. Even though it was a little bit pricey in my opinion, I highly recommend the Lawton Stables trail ride. We will definitely be back. Our grands loved hanging out here with some friends. 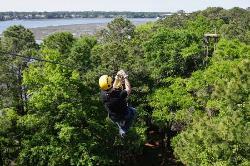 Great inexpensive option for a morning or afternoon of fun. Animal food may be purchased at the stables. The horses and cows cannot eat the same food as the animals in the zoo, but our friend called ahead and brought bags of carrots and apples for them. The kids loved feeding the Clydesdale.